Four years, countless consultancy fees, umpteen broken promises and many millions of pounds later, Clissold Leisure Centre in Stoke Newington is finally re-opening this weekend. For those who've not followed the saga, here's the story in brief. In 2000 the Centre opened amidst a brass band's worth of pomp and publicity, the very model of a modern, major, New Labour endorsed Lottery-funded Millennium project. Come early 2004, the facility was closed, having accumulated a staggering 59 serious defects - everything from warped floors to a leaking roof to a badly thought-out changing "village" that promptly alienated Stokey's Muslim and Hasidic Jewish communities. The elegant building seemed doomed, a notion not entirely dismissed by Hackney council's constant goalpost-shifting when pressed about a possible re-opening. However, on 15 December the Centre will finally be welcoming the public through its doors again. The building is now in the hands of GLL, who run a number of fitness centres in London and - auspiciously - masterminded the successful renovation of London Fields lido in 2005. Londonist had a tour round the building this week, and we were mightily impressed. The 25m, 8 lane pool is set up for sporting events as well as keeping fit - ideal for those 2012 hopefuls to get some practise in when the Olympic-sized pool at the aforementioned London Fields gets too chilly. The fitness rooms look very modern, with ranks of all-new equipment, and the floor throughout is sprung to give those ankles a rest. Throw in a couple of squash courts, a sports hall with pull out bleachers, a health suite and a cafe, and you realise that there's enough here to interest even the most un-sporty types. The building's sleek design is reflected inside, with plenty of natural light filtering through and giving the place an inspirational air. We were also assured that issues surrounding the changing "village" have been addressed. The membership fee, normally £35, is being waived during December. Whether that's a feeble apology for the years of closure, or a carrot to entice in locals who scarcely believe that the place will be open, it's still a bargain. With regular adult membership at £37.50 per month, it's bound to be popular. We just hope that it stays the course this time round. 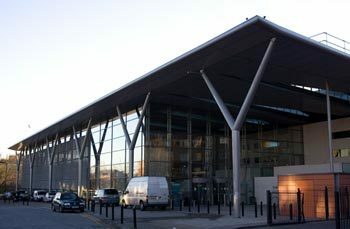 Clissold Leisure Centre, 63 Clissold Road, N16 9EX. Opens at 9.00am, Saturday 15th December.